Memorial Day serves to honor our fallen heroes. Part of that involves caring for our soldiers still with us. Understanding and acknowledging the mental components of their suffering remains a vital and underachieved need. Our soldiers disproportionately suffer from several mental disorders, notably, post-traumatic stress disorder. 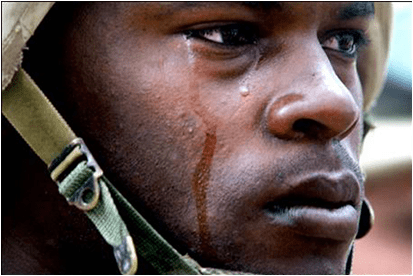 Today’s post begins a review of post-traumatic stress disorder (PTSD). We thank all of our veterans for their service. I’ve dealt with disease and death everyday as an Emergency Physician, and it has been dehumanizing on many levels. Imaging having to pronounce someone dead despite giving your version of a superhuman effort to resuscitate them and then having to deliver the news to a family deep in prayer and holding on to strings of hope. Oh yeah, and then you immediately get to return to a room filled with patients and families oblivious to anything you’re dealing with as an individual, who are completely immersed in their personal situations and often complaining because “you took too long.” Imagine the lives of morticians or cemetery workers, having to stare at and feel the remains of the dead all day everyday. Imagine the lives of those habitually raped or viciously beaten by a loved one as a child. And, of course, there are the soldiers. Over 7.5 million Americans are thought to be suffering from post-traumatic stress disorder (PTSD), approximately one in every 40 individuals. Traumatic and post-traumatic stress are not only able to affect your reality, but to adjust your reality. The body’s normal “fight-or-flight” response to danger or extremely stressful situations can evolve into abnormalities in your behavior if you are continually immersed in these environments. One such as the emergency physician may become desensitized and/or empowered to address situations that would make otherwise normal individuals recoil, or one may become overly sensitive, hyper-stressed and prone to a fight response to lesser stimuli—or no stimuli at all. There are three categories of symptoms of PTSD, which are easily remembered by thinking of a hyperactive “fight-or-flight” response: reliving traumatic experiences, avoiding circumstances or situations that remind one of the experience, and reacting out of hyperarousal to stimuli suggestive of the experience. Reliving can involve flashbacks, scary thoughts and nightmares. Victims have been known to actually re-experience the physical and mental episodes, complete with palpitations, sweating, jitteriness and severe anxiety. Such experiences can become incapacitating. Avoidance is in many ways the opposite end of the “fight or flight” syndrome. In this example, avoidance isn’t just being proactive and staying away from reminders of the experience, but it can escalate to loss of emotions or even recollection of the event. This isn’t a strategic decision; it’s a defense mechanism gone haywire. As an example, imagine the near-drowning victim who refuses to even sit on the beach. Hyperarousal leads one to be on edge, sensitive and prone to overreact. In contrast to the other two symptoms listed, hyperarousal tends to be a constant state of being. PTSD victims with hyperarousal describe themselves as easily angered and always stressed. Many if not most of us will experience traumatic events in our lives sufficient enough to cause tremendous stress. There are circumstances that enhance the risk of developing PTSD. Childhood trauma is especially dangerous in that the developing brain can respond “appropriately” in coding for abnormal circumstances and exposures. Subsequent trauma can trigger PTSD-quality responses. Women are more likely to develop PTSD than men. Mental illness may abnormally shape responses to traumatic events. There is some evidence that susceptibility to the disorder may run in families. Individual differences in the brain or genes may predispose an individual. The relative absence of social support and a functional network is a severe risk. The presence of these “resilience factors” does not suggest that those suffering from PTSD are lacking in any way; it suggests the best opportunities for you to avoid succumbing to the enormous pressures that exist. Thank you Dr. Sterling for this post on Memorial Day. Our men and women in the Armed Services deserve our understanding and best medical care as this impacts every aspect of their lives.